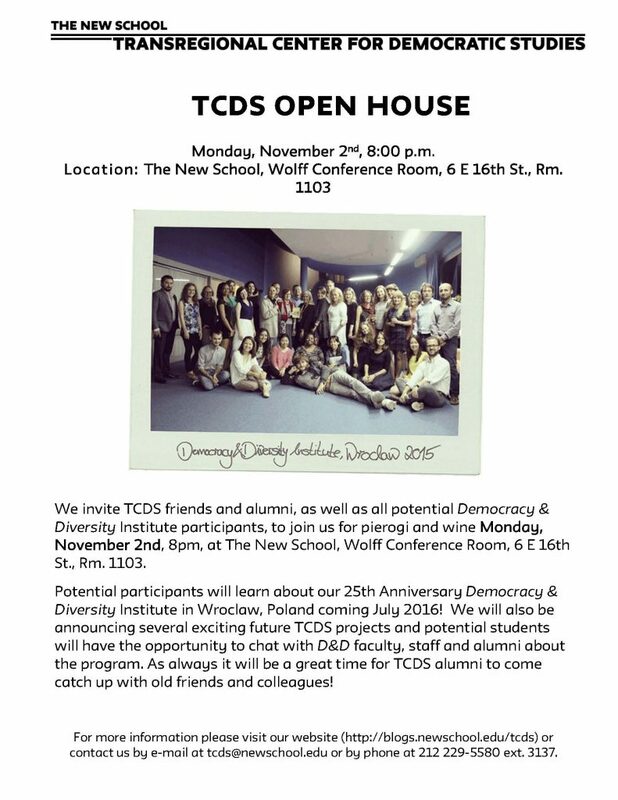 We invite TCDS friends and alumni, as well as all potential Democracy & Diversity Institute participants, to join us for pierogi and wine Monday, Novemeber 2nd, 8pm, at The New School, Wolff Conference Room, 6 E 16th St., Rm. 1103. Potential participants will learn about our 25th Anniversary Democracy & Diversity Institute in Wroclaw, Poland coming July 2016! We will also be announcing several exciting future TCDS projects and potential students will have the opportunity to chat with D&D faculty, staff and alumni about the program. As always it will be a great time for TCDS alumni to come catch up with old friends and colleagues! or by phone at 212 229-5580 ext. 3137. Application Deadline extended for New School and Non-New School Students for 28th Democracy & Diversity Institute, Wroclaw, Poland! New School Application Deadline Extended for the 28th Democracy & Diversity Institute in Wroclaw, Poland! Congratulations to Global Dialogues 2016 Alumni! Full Scholarships now available for the TCDS Summer 2019 Democracy & Diversity Institute in Wroclaw, Poland, for students from Eurasia and Turkey! Meet Our New Global Dialogues 2019 Fellows!